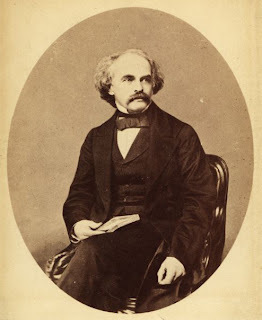 Author of The Marble Faun (1860) and possessor of a fine early Nietzsche. i submit that in this case nathanial hawthorne is a FRAUD. it looks like he's wearing a fake moustache, p'raps to impress some wanton hussy via correspondence. As a long-disceased Civil Servant, I must defend this clerk's moustache. It (was) perfectly appropriate to his station & circumstance & most likely served him well.